but I just threw this baby together and had to share. I just came across this font from a post from Little House Blog. Isn't it just so Halloween-ey? It made me want to create something, so I did. Oh yeah, print your own if you want to! 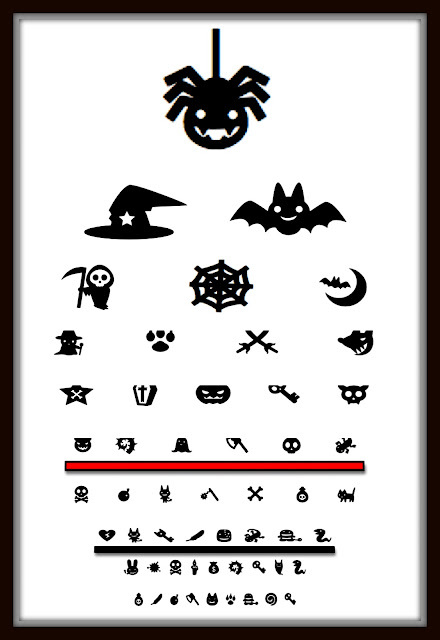 I have seen all sorts of eye charts but this one tops them all! Thank you for sharing! I would love for you to come share it with us at our first ever 4th Friday Finale @ Over the Big Moon! Thanks for letting us print one too! This is really cute. I think I will have to print this up...thanks for sharing! Cute idea!! Thanks for linking up to Sassy Sites FFA party! Have a wonderful Halloween weekend! XOXO!! I’m visiting you from Petite Hermine’s Sunday Linky Party. I also have a Weekend Link-Up that I’d love to have you join. You can link anything related to Homemaking: recipes, sewing, decorating, crafts, DIY, a story about what you did today, etc! There’s a button at the top of my sidebar that you can take to help you remember to come back each weekend. My eyes are playing tricks on me. I'm seeing some very scary objects! Thanks for sharing at Potpourri Friday! this is cute. if it's too late for this year, it's never too early to get things for next year! Just stumbled across this tonight -- it's absolutely adorable. I need to bookmark it for next year. My husbands an optometrist. He's going to get a kick out of this. Thanks for sharing! !